The Netraheen Jagriti Sangh, an outfit of unemployed blind people of Haryana, today received support from the Scheduled Caste Advocates Association of the Punjab and Haryana High Court. 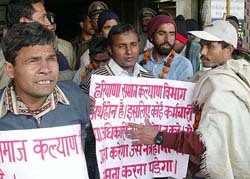 Blind picketers in front of the Haryana Social Justice and Empowerment Department in Chandigarh on Monday. The Powergrid, a public-sector outfit, has lost out to a private company in getting a contract for setting up a 220-KV substation at Gurgaon to augment the city's burgeoning need for electricity. After a long time, urban voters in Haryana have come to occupy a crucial position in electoral politics of the state. During the past few Assembly elections, urban voters had been going by the trends in the countryside and towards the end of the campaigning, they swung towards whichever party appeared to be winning most seats. The Congress rally on January 7 at Kurukshetra will be historical for which consent from the observer of Haryana, Mr Naval Kishore Sharma, has already been granted. Will Haryana go for early Assembly poll? Annual day function was held at Bhartiya Public School today. The students presented a scintillating cultural programme. Tiny tots won the appreciation of the audience and Mr Ramesh Chandra Aggarwal was the chief guest at the function. At a time when Bollywood was in a nascent stage and Hollywood reigned supreme, a cinema hall in Ambala showed only English movies. White Theatre in Ambala Cantonment was known for the English movies that were screened here. The cinema house, which was a legacy of the British Raj, is said to have closed down even before the country became independent. 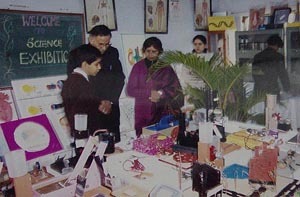 A science exhibition was held at Major R.N. Kapoor DAV Public School, Ambala Cantonment on Saturday. The Assistant Commissioner of K.V. Sangathan, Mr J.D. Kalra, accompanied by school Principal K. Relan inaugurated the exhibition. The Deputy Commissioner, Dr R.B. Langyan, today appealed to people to donate warm clothes for distribution among the poor. He also appealed to NGOs to help collect old clothes for the purpose. The Haryana School Education Board has announced the dates of middle, matriculation and senior secondary annual examinations, 2004. The Netraheen Jagriti Sangh, an outfit of unemployed blind people of Haryana, today received support from the Scheduled Caste Advocates Association of the Punjab and Haryana High Court. Mr Baburam Dahiya, president of the association, who is also the general secretary of the legal cell of the Haryana unit of the Congress, said he would file a petition in the High Court seeking filling of the backlog of the Haryana Government posts reserved for the visually handicapped. He was speaking at the site of a demonstration organised by members of the Natraheen Jagriti Sangh in front of the Social Justice and Empowerment Directorate here today. The agitators also tried to prevent employees of the Directorate from entering the office. Members of the sangh have been agitating for more than three months but they are yet to receive support from any of the political or social organisation. Mr Bhupinder Singh Hooda, Congress MLA and Leader of the Opposition in the Haryana Assembly, is the only politician who issued a statement some time back in support of the sangh’s demands. Mr S.S. Shukla, a blind man who was given appointment by the Haryana Government in 1988, summed up the situation, saying that politicians were not interested in the demands of the visually handicapped because they did not serve the purpose of vote bank politics. Mr Rajinder Sihota, an advocate, also offered legal help to the agitators for pressing their demands. Mr Jagjit Singh Saini, general secretary of the sangh, said they had decided to shift the site of their sit-in from near the 30 Bays Building to the space outside the office of the Social Justice and Empowerment Directorate. They would be spending the nights in the open from today, he said. The Powergrid, a public-sector outfit, has lost out to a private company in getting a contract for setting up a 220-KV substation at Gurgaon to augment the city's burgeoning need for electricity. Official sources said that at a meeting of the high-powered purchase committee of the Haryana Government held here last week, it was decided to award the contract to the private sector giant, Siemens India Limited, on turn-key basis. The substation would be ready by November 1, 2004, the sources said. They added that the substation would be fed by a 220-KV line and this work had been allotted to K. Ramachandra Rao of Hyderabad with a commitment that this too would come up by November 1, 2004. The deal with the company was also cleared at the meeting of the purchase committee. While the combined cost of the two projects would come to about Rs 25 crore, Powergrid reportedly sought Rs 37 crore for carrying out the works. Listing the various short and long-term measures proposed for augmenting the power infrastructure of Gurgaon city, the sources said in the next two years, the 220-KV capacity in Gurgaon would be enhanced by 700 MVA against the existing capacity of 360 MVA. They, however, added that the reluctance of some of the private colonisers and developers to fulfil their commitments about setting power generation facilities may play truant with the projected growth of power availability at Gurgaon. They said the DLF, which had committed to setting up three substations at Gurgaon and had already recovered the cost of the substations from their clients, had so far set up only one substation. Recently, following the state government's insistence, DLF agreed to create a 220-KV substation and a 66-kv substation in F-Block. The builders had also agreed to set up a substation at Cyber City at Gurgaon. Similarly, Unitech, Ansals and HLF Ambience were also being pressurised by the government to fulfil their commitment of constructing 66-kv substations in their respective pockets, the sources said. After a long time, urban voters in Haryana have come to occupy a crucial position in electoral politics of the state. During the past few Assembly elections, urban voters had been going by the trends in the countryside and towards the end of the campaigning, they swung towards whichever party appeared to be winning most seats. However, over the past few months several factors have put them in the driver’s seat. The most important factor is the situation created by factionalism in the Haryana Congress and the widening gulf between the Bhartiya Janata Party and the Indian National Lok Dal. Both the Congress and the BJP have traditionally enjoyed the support of urban voters for long. However, both have lost much ground over the years. The Congress influence has receded because the factions led by Mr Bhajan Lal and Mr Bhupinder Singh Hooda have been fighting more with each other rather than with the government . On the other hand, the BJP has lost much of its sheen because of the disaffection with its alliance partner, the INLD. This political vacuum in urban constituencies has made the urban voter the cynosure of the eyes of other influential political parties, mainly the INLD and the Haryana Vikas Party. Mr Bansi Lal’s relentless campaign after losing the last Assembly poll has succeeded in reviving the party’s fortunes to a large extent in the rural areas and to a slightly lesser extent in the urban constituencies. Nevertheless, the HVP is concentrating keenly on the towns and cities. The INLD, realising that it is not as strong in the urban areas as in the countryside, is now planning to devise a strategy to win over the urban voter. The general feeling in political circles at present is that in the event of an early Assembly poll, if the ruling INLD, the Congress and the HVP happen to share the honours in the rural areas, the urban Assembly segments could tilt the scales in the favour of any of these parties. There lies the newfound importance of the urban voter in a state in which ruralites always have had a greater say in politics. The urban population is aware of the development. Over the past few weeks, as rumours of simultaneous Lok Sabha and Assembly poll have begun to spread, discussion on political issues has replaced small talk and gossiping in tea stalls, bars, clubs and social gatherings so much so that even funereal gatherings are not immune to it. Otherwise, such discussions have been the hallmark of the villages where politics is the hot favourite of groups of idlers playing cards on both sides of the roads passing through the villages. Political analysts, however, caution that the phenomenon could be short-lived. They say the situation could change if only the Lok Sabha elections are held in a few months from now. In that case, the alliance of any regional party with the BJP could make the urban voter a hapless tool in its hands. The Congress rally on January 7 at Kurukshetra will be historical for which consent from the observer of Haryana, Mr Naval Kishore Sharma, has already been granted. Mr Nirmal Singh, Congress leader, talking to newspersons here today, said the rally would be addressed by Mr Bhupinder Singh Hooda, leader of the Opposition in Haryana and Mr Virender Singh, former Haryana Pradesh Congress president, among others. Mr Nirmal Singh alleged that the Chief Minister had ignored the interest of those living in north Haryana. He appealed to all Congressmen to strengthen the party. He said it was the prerogative of MLAs and the party high command to choose the Chief Minister of a state. He alleged that jobs had been given to those who were close to the Chief Minister and the interest of the common man had been ignored. FATEHABAD: The proposed “Hisaab chukao” rally of the Congress at Kurukshetra will try to expose the “misdeeds” of the present INLD government in Haryana. This was stated by Mr Chhatrapal Singh, a senior Congress leader and a former Haryana minister, while addressing mediapersons at Bhuna in the district, where he had come in connection with preparations for the rally. Mr Chhatrapal Singh alleged that INLD government had failed to honour the commitments it had made to the people of Haryana. He alleged that the state government was an utter failure, be it on the law and order front or providing basic amenities like water and power to farmers. He said the organisers of the rally were extending invitations to all Congress workers in the state. When asked whether the permission of the HPCC chief, Mr Bhajan Lal, had been taken for the rally, Mr Chhatrapal Singh said the organisers had obtained the permission of the AICC in charge, Haryana affairs, Mr Naval Kishore Sharma. Annual day function was held at Bhartiya Public School today. The students presented a scintillating cultural programme. Tiny tots won the appreciation of the audience and Mr Ramesh Chandra Aggarwal was the chief guest at the function. The programme began with the welcome song followed by ‘Saraswati Vandana’. The KG students presented `Rhymes' while the junior students performed a lively Qawwali. ‘Rhymes’ was also presented by junior students. Haryanvi dance and bhangra were also presented by students. School Principal I.D. Sharma said the students have excelled in academics as well as in co-curricular activities. Tributes were paid to Capt Atul Somra who had been a student of the school. Mr Sharma said a number of students have secured admissions in engineering colleges as well as in medical colleges. In sports, the students have done well in judo, boxing, basketball, hand ball, badminton, football, table tennis and cricket. At a time when Bollywood was in a nascent stage and Hollywood reigned supreme, a cinema hall in Ambala showed only English movies. White Theatre in Ambala Cantonment was known for the English movies that were screened here. The cinema house, which was a legacy of the British Raj, is said to have closed down even before the country became independent. White Theatre is in ruins today. The cinema, which was the centre of social activity at one point of time, wears a deserted and desolate look now. Shrubs have grown all over the place. Yet the grandeur of the building is evident from the portions which are still standing. Mr Sukhdev Sareen, President of DAV Public School, Ambala Cantt, recalled that White Theatre and Capitol cinema houses were popular among the Britishers for watching English movies. ‘‘White Theatre was perhaps one of the first cinema houses to be constructed in Ambala Cantt. The cinema house was shut down in the late 30s,’’ he said. Mr Sareen observed that younger generation is unaware of the fact that White Theatre was located closed to Mall Road at the intersection of Bank Road and Durand Road. ‘‘White Theatre used to show English movies. In those days, going to the movies used to be a an occasion for family outing. People used to have food and drinks in the hall," he said. He said White Theatre and Capitol Cinema used to screen English movies while Nigar and Nishat cinema house used to screen Hindi movies.‘‘The Britishers had movement restrictions and they were not allowed to move freely outside the Cantonment area. So, it primarily meant that they used to watch movies in the two cinema halls which fell within their area,’’ he said. Mr Sareen said his father, Lala Beli Ram Sareen, had bought Capitol cinema house. ‘‘Lala Beli Ram Sareen had been the owner of the famous Plaza Theatre in Connaught Place, New Delhi. As a matter of fact, Naulakha in Lahore, which was owned by him, was one of the first cinema halls to show talkies,’’ he said. He said nearly six-seven decades back, the cost of watching a Hindi movie was four annas while the cost of the ticket for a English film was Rs 5. ‘‘There was no tax in those days and the movies used to be screened on percentage terms,’’ he said. Mr Sareen said they used a portable projector and the length of the cinema hall was 50-60 feet. ‘‘The size of the halls was increased after arc lamps with carbon system, including reflectors, were introduced. Even the screen used to be much smaller and it used to be made of net. Thereafter, it got replaced with plastic screens,’’ he said. The cinema houses used to be stylish with sofas being provided in balcony. The English theatres used to have a bar with restaurant. There was all wooden flooring. Interestingly, there used to be only two shows, one at 6 pm and the second one at 8 pm in the cinemas where English movies were screened. The seating arrangement was similar to the one that is in practice today. There used to be a balcony, dress circle, boxes and first class. On the weekends, Capitol cinema house was converted into a skating rink. ‘‘The furniture used to be taken out and there was ample space for skating. And in year end during Christmas and New Year, the cinema house used to be closed and used for hosting dance parties,’’ Mr Sareen recalled. A science exhibition was held at Major R.N. Kapoor DAV Public School, Ambala Cantonment on Saturday. The Assistant Commissioner of K.V. Sangathan, Mr J.D. Kalra, accompanied by school Principal K. Relan inaugurated the exhibition. Students displayed scientific temper and they explained the different models which were related to latest innovations in the field of science and technology. Mr J.D. Kalra appreciated the efforts put in by the teachers including Ms Rekha Bakshi, Ms Sonia Relan and Ms Sandeep Kathuria. The projects based on topics related to food and health, information technolgy and transport and communication. The students conveyed the message of healthy living through dramatisation stressing upon the ill effects of obesity. The concept of working of communication satellite, dream city, pulse-polio campaign and earthquake sensors were also displayed. Speaking during his weekly open darbar here today, he said it was the duty of all to ensure that the poor did not die for want of sufficient clothes during winter. He said the administration would collect old clothes donated by people from 9 am to 5 pm until January 5 at the local Bal Bhavan. He said anyone who was poor could get blankets from the District Red Cross. Later, he visited the General Hospital and took stock of the facilities provided to patients. While stating this here today, a government release said the middle examinations would be conducted from February 16 to 24, the matric examinations from March 13 to 25 and the senior secondary examinations from March 12 to April 7. The release said all the examinations would be held in the afternoon session (1 p.m. to 4 p.m.). Mr Sat Prakash, Commandant, 3rd Bn, HAP, has been given additional charge of SP, State Vigilance Bureau, Hisar, vice Mr Pirthi Singh who is retiring on Wednesday. This was stated in a Haryana Government release here today.